Hi there: I used to have a lot of trouble baking sourdough, and eventually, by accident, I figured it out, and am now able to consistently bake a well risen, lightweight, tasty, naturally risen bread. My overall technique differs from everything out there, though, which leads me to wonder what am I making, or what am I doing? Autolyse without salt for 30 minutes, mix on med for 4-8 minutes, bulk for 2-2.5 hours with occasional folds, proof for 2-3 hours (or 20 minutes, then fridge for 8-16 hours), bake. I measure dough temps, in order to plan on timing. 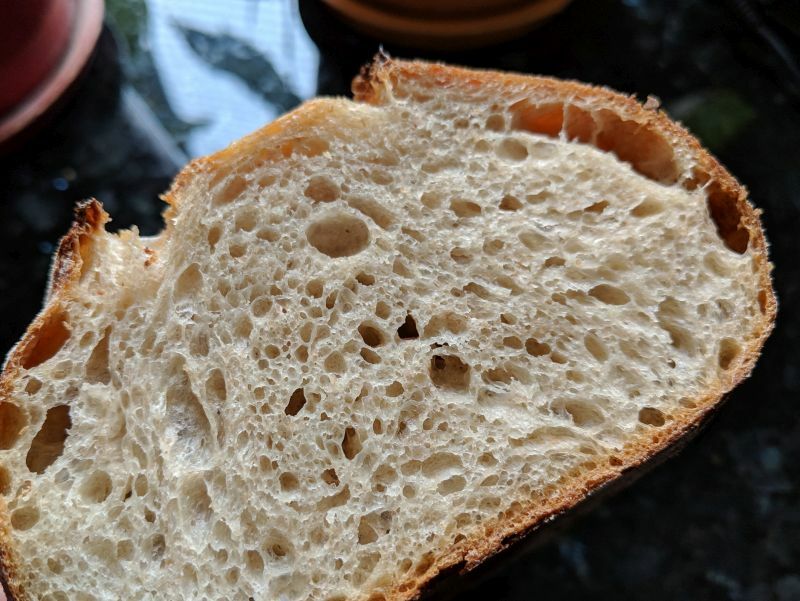 The breads I've tried making with smaller starter % end up being a bit denser, not as lightweight, smaller crumb - still taste good, in fact, almost no difference compared to the above. Since this large starter percentage works very well, I will of course, keep using it, and it's not difficult converting others' recipes into this for me. It has the added benefit that it works quite well with my daily schedule. Despite this, it still leads me to wonder, what am I doing? Why aren't others using the higher % starter? Compare to Shiao-ping's and check out her blog. It's just the way one looks at building a levain. Building a levain gradually, usually yields a milder tasting crumb. What do you say? What are your temperatures? Your starter seems to be working for you so I wouldn't worry about it. Maybe if you notice the starter getting weaker or taking longer to rise, you might want to do something to increase the yeast numbers but frankly, if it works, keep at it. Do make a back up starter while it works for you. Dry some discard starter and store in a dark cool place. Thanks for the link to Shiao Ping's recipe. 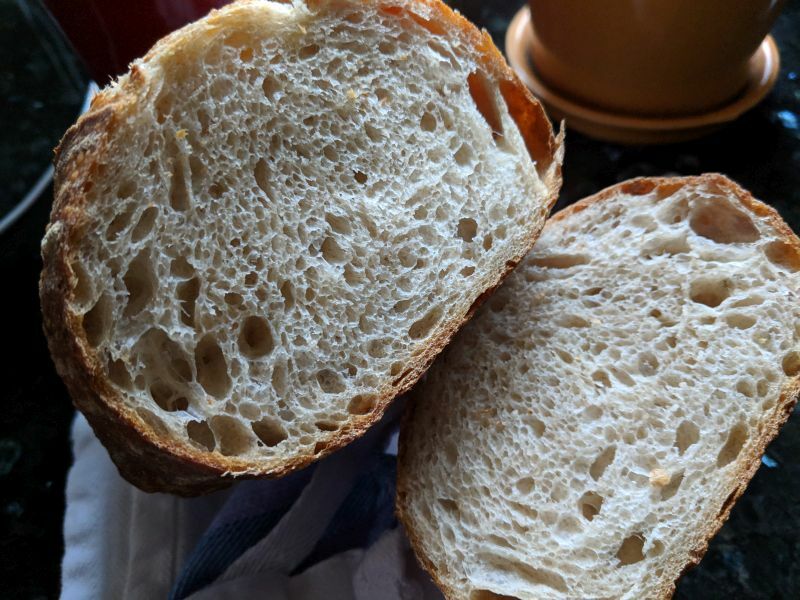 ""Building a levain gradually, usually yields a milder tasting crumb." How do you build one not-gradually? I'll confirm my bread is very mild with no tang, as exected, since I build 1:1:1 at 12hr intervals until I have enough. I try to keep dough temps in the 70s. If at the lower end, bulk and proof are longer, if at the higher end, shorter :) Ambient temps right now are high 50s low 60s. Thank you for the confirmation :) I am going to keep doing things the way I am, since it works, but will still occasionally experiment as it is fun! Struggling a little with the double negative ("this is not atypically large") hahaha :) Having come across a lot of your past discussions and posts, I understand some of the theory of having a smaller amount of starter, which could improve flavor and/or tang/sourness, but it will need the balance of both time and temp. Previously, my trouble with smaller amounts was that I could not tell when the dough finished its ferment time.. however, since I have a starting point with consistent bread, I've been able to experiment with smaller amounts and for now, it's not yielded any improvement, and generally a denser bread. You probably haven't been doing sourdough long enough to have witnessed trending, but 15-20 years ago when I came onboard, most home sourdough bakers (a much smaller number back then) were using 25-33% or so. That's why I say your 30% is not atypical. It was typical at one time, and still perfectly valid if you're getting the results you want. Since then, prefermented flour seems to be trending downward as hydration has trended upward, following what has been happening in the professional realm, and influx of baking books written by rock-star production bakers. But making bread at home in small batches can be very different from large-batch fermentation in a production environment. That 2 1/2 hour bulk fermentation on Vermont Sourdough (which the Norwich is based on) might take twice as long for a home baker like myself --- something that would take a month of Sundays to figure out if you're cautiously adding only 15-30 minutes to what a recipe says. That's where I was until I messed up one day and completely forgot I had dough fermenting ;-) My bread really opened up that day! That is interesting, I wonder what's behind the higher hydration, lower starter trends, versus higher amounts from a while back? I've only been playing with sourdough for 5-6 years - it started really well, I had to take a few years break, then started up again a couple years ago, struggling with consistency. Sometimes there'd be a good bake, but I couldn't repeat it! Late 2018, I miscalculated the starter and had fantastic results, and continued to do so each time I tried it. The 30% preferment (as % of total flour) works so well for me and my schedule. Just like your Sunday 15-30 minute tweaks - yup, it was taking forever to find something that worked, then an accident! To confirm my previous statements, I baked two loaves this weekend, with identical ingredients, just different starter amounts. One was 30% preferment flour, other was 2.5% (as percentage of total flour). The 2.5% was nearly no-knead, taking 26 hours to bulk, then 3 hours proof (at ~85-90F, boiled water in microwave). The crumb looks similar, however, the 2.5% loaf was heavier and "denser". I wish I had weighed the final product. They taste pretty similar. Still working on getting the big bubbles out during shaping (big holes on sides hahaha). It's often some sort of flub that causes a quantum leap in learning. Note that we were experiencing the same issue --- underfermented dough. This is a common problem for many new or home bakers. I solve it by extending bulk fermentation time, you solve it by increasing % flour prefermented, and someone else I know solves it by shooting for a higher DDT (desired dough temperature). If there's any surprise here, it's just how significant the change may need to be.